Ask the Teachers: Should I believe the thought that I want a divorce? 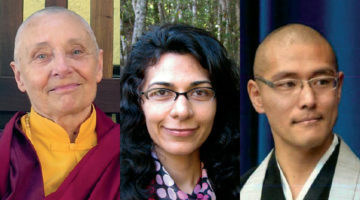 Narayan Helen Liebenson, Tenzin Wangyal Rinpoche, Sallie Jiko Tisdale. Photos by Mary Lang, Nicolas Gournaropoulos, Kim Campbell. I’m not sure I understand the statement, often evoked by Buddhists, “Don’t believe everything you think.” How can I know which thoughts to believe? For instance, I seem to constantly have an unbidden thought that I wish I weren’t married to my spouse. But then I think, well, I’m a Buddhist, I don’t have to believe this thought. Besides, this is not something I would discuss or act on—it would totally devastate my wife. I hold to other Buddhist-inspired thoughts as well, such as be kind and don’t hurt people, and I try to follow the bodhisattva vow, putting her happiness ahead of mine. But this nagging, unbidden thought won’t go away. When does not believing your thoughts become something like disassociation or even lying instead of something wholesome? This is a great question. Basically, the answer is very simple: according to Buddhism, not following or trusting your thoughts is the correct view, particularly thoughts that are conditioned by hope and fear. So how do you work with the persistent thought that you wish you weren’t married to your spouse? You can change your conditions. People do this all the time: we open the window when the room is stuffy, we change jobs, we move from one location to the next, we divorce. If you engage in a certain level of reflection, you may surmise that there are conditions that support you to be happy and to feel more flow and creativity in your life, and other conditions that seem to block this flow. So one possibility is to arrange the conditions of your life to maximize happiness and minimize suffering or discomfort. If you live or work for someone who doesn’t understand or respect or acknowledge the conditions that support you, you will suffer more. So you can change your conditions. People do this all the time: we open the window when the room is stuffy, we change jobs, we move from one location to the next, we divorce. Instead of (or in addition to) looking outward at the causes and conditions of our suffering and rearranging the furniture of our life, we can also look inward at the one who is suffering. And how we look—the method we use and the quality of the observer—makes all the difference in the result. Analyzing the reasons and causes for our choices may allow us to have more compassion for the complexity of our human condition and the consequences our actions have on others. Here, it may not be so clear that simply moving on is a choice we want to exercise. Will we just recreate the same mess all over again? The path of meditation offers an additional possibility: look at the thought and the thinker of the thought nakedly and directly, without judgment or analysis. Abide in meditation and host the pain identity, pain speech, and pain imagination to its dissolution again and again. Discover the source, the nature of mind, free of ego’s attachments and aversions, and develop confidence in the free and open space of being and the expression that then arises. In order for this path of meditation to be successful, it is necessary to open to the pain you are experiencing and not dismiss it with another thought. You are not free of suffering in saying, I wish I weren’t married to my wife, but I don’t want to cause her pain, so I will stay. In my tradition, that is analogous to trying to clean blood off your hands by washing them with more blood—replacing one suffering thought with a better, more virtuous one. This is not a superior method for the liberation of suffering. Develop some stability in your meditation practice by connecting with the stillness of your body, silence of your inner speech, and spaciousness of mind. As you settle and connect with a sense of being and are able to bring your attention back again and again from thinking and fantasy, allowing this mind to rest, you will feel a certain peacefulness. The observer becomes increasingly subtle, often releasing entirely while abiding. Having experienced the spaciousness, awareness, and warmth of your natural mind, you can then reflect on the thought, I wish I weren’t married to my spouse. Intentionally bring this to your meditation and notice what happens. Feel any disturbance in your body, breath, or imagination. Embrace the experience fully, opening to allow the movement of pain. When fully allowed, the expression of pain will exhaust. It is important not to elaborate, analyze, or change anything. Just nakedly observe. Discover the truth of cessation. In the freshness of your experience, you will see your life through new eyes. What begins as suffering liberates, and the expression that arises from the openness you experience will transform your life. When a thought occurs repetitively, it is asking to be explored. 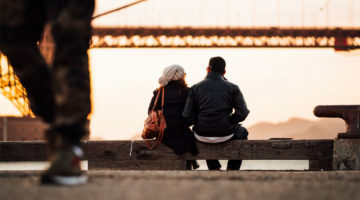 The specifics of the situation with your spouse merit your care and attention and perhaps the help of some good psychotherapy or counseling as well. The emotional component of this recurring thought needs to be greeted with interest and openheartedness. The Buddha spoke about thinking in two different ways: one is to see into the emptiness of thoughts, and the other is to divide thoughts into the categories of wholesome and unwholesome. Wholesome means that which is whole, leaving nothing out, including yourself. Intentions of kindness, compassion, joy, and equanimity are wholesome thoughts. Unwholesome means fragmented; intentions of ill will, cruelty, and grasping are unwholesome thoughts. What really makes it wholesome or unwholesome is not the content so much as the intention that gives rise to the content. A seemingly wholesome thought could be fueled by fear, for example. Instead of being fearful or averse in relationship to this thought, try exploring it to allow understanding to arise. Neither the content nor the process is dismissed in dharma practice. If we only see thinking as empty, without any awareness of its content, we won’t know our own particular conditioning and will unconsciously act in accordance with it. If we only see thinking as solid and substantial, each thought true and believable, we will be endlessly caught in conditioning with no access to unconditioned freedom. In order to embrace both of these dimensions, can you go deeper into the many aspects of this thought that is arising? What is happening in the body when this thought arises? Do you notice the sensations and felt experience? What emotions are associated with this thought? Are there particular times and contexts in which it arises? Instead of being fearful or averse in relationship to this thought, try exploring it to allow understanding to arise. If you are pushing a thought away and trying to believe in its empty nature, you can be sure that a predominant thought is being inadvertently cherished—kept intact by fear, aversion, and confusion. Because of that, it is more likely than not to morph into action and speech if not addressed through honest and sincere exploration. The thought that is constant for you is the same thought that is sometimes said to be most common for everyone: Get me out of here! “Here” is wherever you are. Changing the conditions of your life may mean simply exchanging one set of challenging conditions for another. Or it may mean facing a fear of stepping into the unknown by not trying to convince yourself that this thought is really empty, wrong, and not to be believed. It is impossible to say without a thorough investigation. Can you communicate your dissatisfaction in a respectful way without negating the marriage? Can you respect your spouse’s intrinsic wisdom without deciding for her that she would collapse? Finding the right questions to ask is one way to begin. If you practice seriously, you will eventually reach a point of paralysis. You begin to drop preconceived ideas and doubt your habits, choices, and even your thoughts. You begin to doubt the entire fabric of your life. Eventually, your old ways of thinking and behaving don’t seem to work anymore. There’s no place to turn, nowhere to go. Wumen said, “Arouse a mass of doubt with your whole body.” This doubt isn’t skeptical or resisting or withdrawn. Rather, it is curious and probing. When we pay close attention, we are filled with questions, and this questioning becomes open and receptive. This is the Great Doubt. It may feel as though you are frozen in place—after all, you can’t even believe your own mind. But you aren’t frozen. And you cannot stay there. Practice can bring a generosity and compassion that are greater than we ever imagined possible. We see the possibility that our life is really for the benefit of other people. We find it surprisingly easy to give up our time, money, and personal comfort in order to help others. The bodhisattva vows don’t tell us to always put our happiness behind that of others. They tell us to save all beings, and that includes ourselves. The Jataka Tales (stories of the Buddha’s past lives) are good examples of how a truly spacious and loving heart can lead us to even give up our lives. In a way, that’s what you’re thinking about doing—sacrificing yourself for the sake of your spouse. But there are a couple of problems here. First, this is not an “unbidden thought.” In Buddhist terms, the only such thought is the thought of enlightenment. Everything else is conditioned and dependent. Thoughts about leaving your spouse are based on experiences and feelings you have in the here and now. Start by looking at what is troubling you in your marriage. Second, you cannot know if staying married will be the best thing for your wife. You can only guess. Even that which appears devastating, like the loss of a marriage, can end up creating positive changes for people. There is no way to know. Finally, you are also a being who needs to be saved. The bodhisattva vows don’t tell us to always put our happiness behind that of others. They tell us to save all beings, and that includes ourselves. 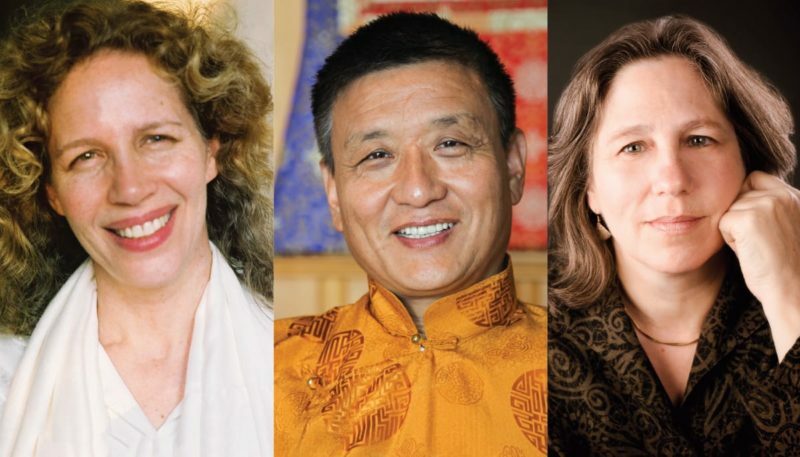 Bodhisattvas are joyous beings. They plunge into the world of change and suffering with energy and cheer. An unhappy person is not a benefit to the world; he or she cannot be really generous or kind. We should act without begrudging what we give, without guilt, and with glad and happy hearts. If you feel no joy in staying married, you are not helping your wife. You are hurting her by adding your pain to her life. How do we live, knowing the limits of our perception? How do we make choices? With care and patience, but also with open hands, accepting that we cannot know the outcome of our actions but must act anyway. You enter the Great Doubt and plunge into great possibility. You totally plunge in.